LAS VEGAS – Negotiators have reached a tentative labor agreement that would cover about a quarter of the 50,000 hotel and casino workers who are threatening to strike in Las Vegas. 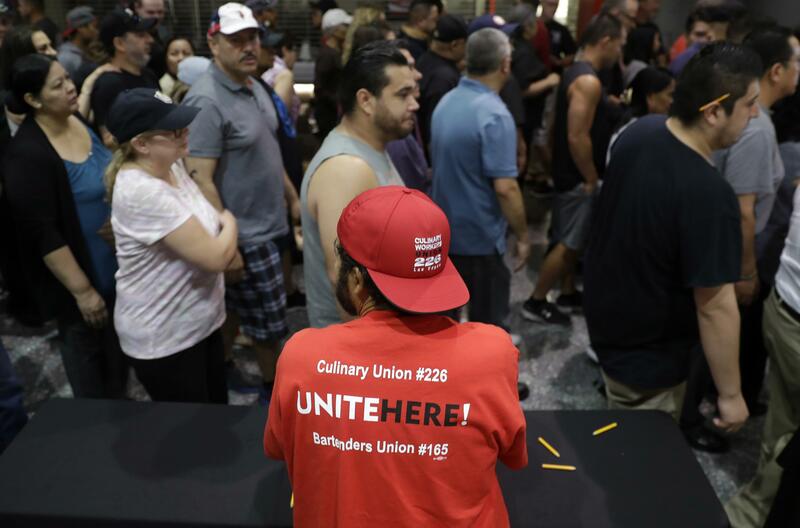 The Culinary Workers Union Local 226 on Friday said the new five-year deal with Caesars Entertainment covers about 12,000 workers at nine casino resorts on the Las Vegas Strip. Tens of thousands of bartenders, housekeepers, bellmen and other unionized workers at 34 casino-hotels on the Strip and in downtown Las Vegas have sought new, five-year contracts for months. Ninety-nine percent of about 25,000 workers voted last week to authorize a strike at any time starting Friday. No date has been set, but workers have started signing up for strike pay, financial assistance and picketing shifts. Wages, workplace training and job security have been the main sticking points in negotiations. Caesars’ properties covered by the tentative agreement are Bally’s, Flamingo, Harrah’s, Paris, Planet Hollywood, The Cromwell, The Linq and Caesars Palace, including Nobu. The Culinary Union and companies that would be affected if workers walk off the job have held bargaining sessions since February. Casino-hotels that could still see a strike, if the deal between workers and Caesars sticks, include Aria, Bellagio, Tropicana, Stratosphere and Golden Nugget. Analysts with Deutsche Bank put the likelihood of a citywide strike “as low” and said they believe negotiations could continue. Casino-hotels would lose unionized bartenders, housekeepers, cocktail and food servers, porters, bellmen, cooks and other kitchen workers in the event of a strike. MGM Resorts International and Caesars Entertainment operate more than half the properties that have been negotiating contracts. Both companies have declined to provide details of their contingency plans. The union and hospitality experts have said the companies would use replacement workers and try to bring some in from properties outside Las Vegas. Properties that would not be affected include Wynn Las Vegas, Encore, The Venetian and Palazzo. “It is hoped that an accommodation can promptly be reached that will enable you to continue to provide the high level of service and professionalism that you have long exhibited,” National Hockey League Players’ Association executive director Donald Fehr wrote. Neither the union nor Caesars on Friday immediately provided details of their tentative agreement. “I wouldn’t be here today had not everybody gone out on strike in 1984 for those health benefits because I came down with a terminal illness,” said Deborah Jeffries, a cocktail server. “It was very important to me that I had that, and it was well worth the walk for two and half months. “We are ready and willing to do this again, not that we want it, but if need be, we will do it,” she said. Published: June 1, 2018, 8:35 a.m.